This series of exercises serves as a mechanism for surfacing interests of the team within the context of planned work. Where do they need more support? What do they want to do more of in their job? What do they want to do less of? It gives an overview of how roles might fit together. Who owns and is accountable for what? Who is supporting them in the delivery? Which parts of the work will fit cleanly within people's existing role descriptions? Which will not, but people want to take them on and are prepared to change their role descriptions to do so? Which parts do we currently not have the skills in house to cater for and will require a hire? What are the unpopular bits and the bitty bits that people are just going to have to 'muck in' and fix? In this exercise, you may get people expressing interest in things which are out of the scope of the project and you may need to burst some bubbles. Remember, any energy invested in personal development should align with the direction of the strategy! Example: If a team member asks for support to become an astronaut, and space flight is not one of your headlines - you got a problem. Many organisations will clearly be different to this and have more rigid role descriptions. School of Data operates in such a dynamic environment that its team needs to be responsive. This system works well for us as people more than pull their weight. Up until the retreat, the notion of 'mucking in' was implicit. People were so great at mucking in that sometimes, they had far too much to do. 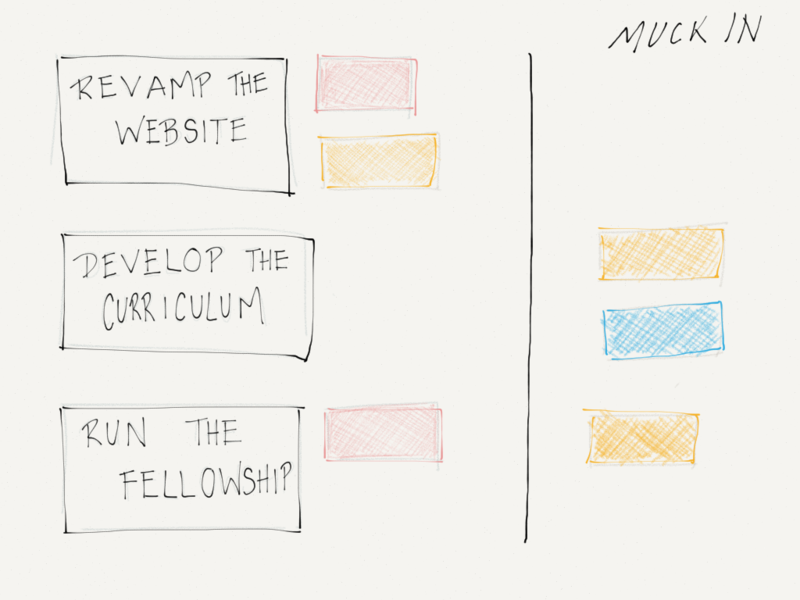 With this exercise I wanted a way to make prioritisations explicit within the muckin pool; i.e ensure that there was a finite amount of stuff which should be prioritised as general tasks for people to contribute to. This activity is led with an individual team member (let’s call her ‘Flick’), the team lead and a HR representative if possible. You’ll need a nice private room with a big wall to stick things on. Depending on amount of discussion time needed - you should allow between 40-60 minutes per person. Give Flick a printed copy of her current role description to refresh her memory (if you did not do this when giving them their personal development plans). Invite the Flick to talk through any major items on her personal development plan, which she should have filled in by now. Templates for personal development plans differ, so make sure she looks back at what worked and what didn't as well as looking forward on the direction that she wants to move her career. Ask the Flick to look at the wall where the headlines are written. She should then comment, based on the interests she has expressed as to which of the headline areas she would be interested in working on. For each area she mentions, take a postit note (remember- each person should have their own colour for the visualisation to work) and place it next to the headline. If Flick has any comments, such as strong preferences or particular roles within that headline, you should flag it on the postit note. Ask Flick whether there are any of the sections that she has mentioned which she would not want to lead on or spend a signifitant proportion of her energy on (>30%), but would be happy to muck in on. Move the postit note over to one side (you can make a line if you want) - to signify that it is a muck-in activity rather than a major part of her role. Step back and take a look - do the parts together look like they would make a logical and feasible job description? Is there anything which is too disparate? Are the number of postits sane? End the session by giving any feedback needed to Flick, making sure she knows she can do the same to you. Wrap with her making it clear that this is not yet a decision about the roles; the activity is simply an expression of interest to help you understand how the roles might fit together. If there is any substantial role change, you will need to follow the company hiring process. Record the position of postits on the wall then remove the postit notes ready for the next person to come in. Repeat this process with all of the team members. Wrapping the activity and producing the visualisation. The next step requires some discretion on your behalf. For our team, this was a pretty uncontentious exercise. No-one wanted the same roles as one another. There were very clear patterns and trends which made for interesting conversations. I was happy that the headlines proposed could be handled mainly with existing staff and a bit of upskilling, because we were working along similar lines to before. I understand that this might not always be the case. And, in the case that it is not - use your judgement for how to present the visualisation back to people. Individually, or as a group. Using the record you made earlier - put all of the postit notes for all of the team members back on the wall against the correct headlines, aligned with the titles and whether they are muck in or a primary part of someone’s role. Plain posits are better than ones with lots of detail e.g. “Billy wants to be PM of the website project” as it might be that not all people can be happy and you need to make sure that decisions are based on merit. Have a look at how they pan out - are there any conclusions you can draw? There are two people interested revamping the website as a major part of their role. There are two roles available on the project, a developer role and a project manager. If the project goes ahead - and we decide it is big enough to post a job advert for, I should make sure that it is brought to their attention to apply for. 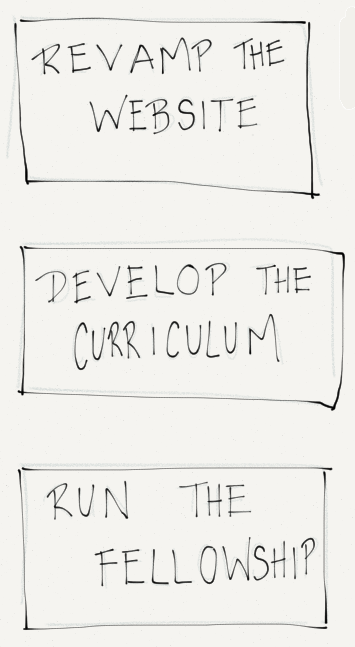 No-one was interested in leading curriculum development. This means no matter what that I need to hire for this role if it is going to go ahead (mucking in is not enough - every task needs a leader). People who are interested in mucking in may be able to help e.g. with editing or road testing. Only one person is interested in leading running the fellowship, and one person is interested in playing a support role. If the person wishing to lead has the necessary skills to run the fellowship, it may be natural to ask them to lead and formalise the role of the person supporting. Show the visualisation to the team. Do they notice anything that you have not noticed? How big is the muckin pool? How should items be prioritised in it?